Emily Dutton (volunteer) with resident fox, Maggie. Maggie has brain damage caused by toxoplasmosis and canine infectious hepatitis and would not be able to survive in the wild on her own. Wildlives needs volunteers. 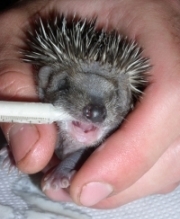 Wildlives is dependent upon volunteer help. Currently there are around thirty people who work here on a regular basis - all on different timetables. Several years ago, thirty people would have been more than enough. However, Wildlives has begun to expand over the last couple of years, and volunteers are needed once more - particularly now the summer season is coming around again, bringing with it countless orphans to be fed and looked after. The work. There is a strong routine at Wildlives, designed to ensure that the disruption caused to the wildlife undergoing treatment and care here is minimal. Primarily, the work involves cleaning, feeding and caring for a wide range of animals and, in doing so, preserving artificial habitats properly in order that they will last as long as possible. All volunteers will be trained in this routine. However, the routine becomes extremely difficult to maintain during the summer months, when the number of admissions increases dramatically and the doors open to a stream of incoming orphans. Volunteers that arrive during the summer will therefore be expected to learn general cleaning routines and help to maintain these in spite of the interruptions for new admissions, and feeding schedules. 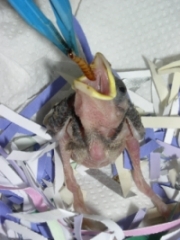 Baby birds, for example, need feeding every forty-five minutes, and cleaning out nearly as often. Work on any particular day is therefore varied and unpredictable - depending, as it does, on what animals are coming in, and how many volunteers arrive to help out. The volunteers. Wildlives needs people who are hard-working, dependable, willing to learn, who enjoy working out in the open-air and - most of all - who love animals and are interested in wildlife. Volunteers will need to be able to work as a team and individually, using their own initiative. They will need to be able to work quickly, but with a close attention to detail - hygiene standards are high and volunteers are expected to keep a close eye on the animals they are caring for. It is this attention to detail that gives Wildlives its high success rate in rehabilitating animals. No previous experience is necessary; all training will be given on the job. Hours are flexible: volunteers work anything from a couple of hours a week to a couple of days a week - whatever fits in with their existing commitments. However much time you have to spare (and, indeed, whatever age you are), if you are willing to learn and you share our commitment to the rescue and rehabilitation of wildlife, we would very much like to hear from you. The benefits. Working at a wildlife rescue and rehabilitation centre is a fantastic experience, and Wildlives is one of the best there is. For those who love animals, what better way could there be to learn about wildlife than by working along -side professionals, seeking to return sick, injured and orphaned wildlife back to the wild in a recovered and healthy state? Such experience may be particularly valuable to those people studying for veterinary science, veterinary nursing or animal care courses. Wildlives also takes students for formal work experience placements. How to apply. The best way to apply is to ring Rosie on 01206 251174. You will then be able to arrange to visit Wildlives at a convenient time when there is an experienced volunteer available for you to work with. Note that placements tend to be of short notice - since it is impossible to tell how busy Wildlives will be from one day to the next.